Monday - Friday. Saturday 9 a.m. to 4 p.m. 9 a.m. to 8 p.m. Saturday 9 a.m. to 4 p.m. Located on Water St. in downtown Prairie du Sac between the Blue Spoon Cafe and the municipal parking lot. Parking is available in the adjacent lot or the lot around the corner on Washington St. Enjoy beautiful views of the Wisconsin River and checkout what our library has to offer. Free WiFi and computers with internet access are available. A quiet reading room with fireplace, study rooms, and adult collection are featured on our lower level. We have programming for all ages including weekly storytimes, ongoing teen programs and special events for adults. 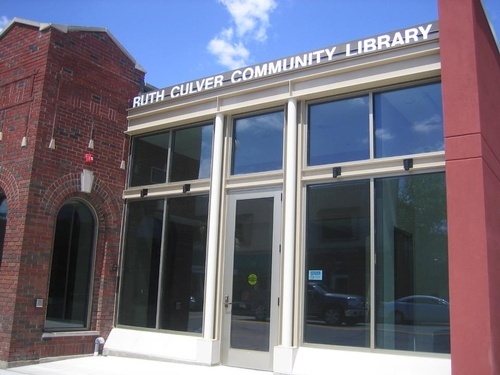 The Ruth Culver Community Library is a member of the South Central Library System. Our collection has more than 55,000 titles including more than 47,986 books.